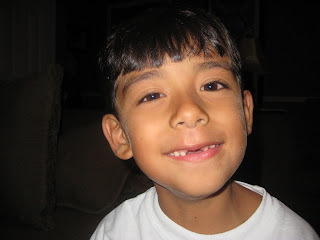 Charles lost his second top front tooth a couple of days ago. He's officially gummy. He actually lost his teeth out of order. He started with his bottom front, instead of the top ones. He's all caught up now. Kent! Hey! I just found your blog via Corinne's, which I found via Susan's ... all to say, I'm glad you have a blog, and it's great to see all of you guys and how much your beautiful children have grown. I'll be a reader from here on out. I wrote something today on my blog about Exxon and I was wondering if I could link to your blog on there? Mine is at www.thejanii.blogspot.com. I was really touched by your story of your grandmother, and honored to be able to share in it a little. It's good to reconnect! I will send a yo out to Corinne, too.